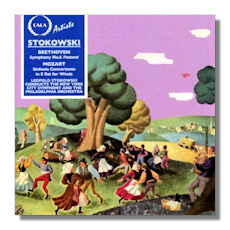 This is the eighth Cala release, all of which have helped fill in the sonic picture of Stokowski's Sound World. Stokowski recorded precious little from the Classical Period. Only two complete works by Mozart (this and the Serenade for Wind Instruments in the early 60's) and one by Haydn (Symphony #53) are found in John Hunt's discography. (There are some rare LPs from the Japanese Stokowski Society, one of which includes a complete Mozart #35 with the New York Philharmonic, oddly omitted from Hunt's otherwise excellent tome) I have to admit I approached this listening with mixed feelings. On one hand I had never heard this before (the LP having been one of the few I was unable to get for the LSSA Library of recordings) and I knew of the greatness of the soloists. On the other hand, how would Mozart sound with the full strings of the Philadelphia Orchestra using free bowing? Would there be so much portamento that the whole thing would sound like a farce? I was pleasantly, no, more than that, I was rewarded by hearing one of the finest recordings of this piece that I know. My God! This is definitely not, however, historically informed. It is pure Stokowski, working with an instrument he had created to be the finest in the world. These were among the final 78s Stokowski made with them. He molds every phrase in a typically romantic manner. You may find the adagio here a bit much at 11 minutes, but in Stokowski's hands this is truly an adagio. This is undoubtedly what David Hall was hearing when he wrote, "This set with its wealth of lovely music would be a joy to every Mozartian were it not for Stokowski's heavy-handed orchestral accompaniment… the soloists turn in superb performances, beautifully recorded." [The Record Book: 1943] If for no other reason than the soloists, you need to hear this disc. Marcel Tabuteau played oboe, Bernard Portnoy was the clarinetist, Sol Schoenbach was on bassoon and Mason Jones played horn. The transfers, by Mark Obert-Thorn, are beautiful. Talking about the transfers, Mark has done a wonderful job with the Beethoven. The NYCSO was not the Philadelphia, and the strings are not as sweet or full. On the other hand, this CD sounds much better than the LP ever did. The sound difference between the two is negligible. I was pleasantly surprised to hear this as it was one of my initial reservations about this coupling. This "Pastoral" is vintage Stokowski. The andante is a very leisurely walk along the brook, taking sixteen minutes. This pace does allow for some wonderful solo work and the violins have a feathery texture to them. The rest of the symphony is less controversial in its pace. The peasant's merrymaking is almost X-rated. The double basses (he must have had a hundred) have a visceral impact. The whole performance has a pulse, a life force in it.